We have been established in the city centre of Wolverhampton since 1974, thats over 30 years experience! Hough’s Hair Salon is along Victoria Street (click here for map and directions) and consists of two floors aswell as private cubicles, offering all aspects of ladies and gents hairdressing as well as hair replacement and wigs. Amongst our staff we have 5 members who have each been working for us for over 20 years. David Hough himself is the founder of the salon and is also a British National Championship Judge, traveling the globe over the years judging several hair styling champsionships. 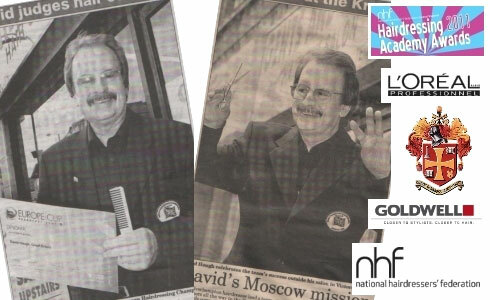 David has recently been awarded ‘Services To hairdressing’ by the National Hairdressing Federation. David Hough Hairdressers Wolverhampton – We are a ladies and gents salon and have been open for over 30 years. Our salon is two floors and is located along Victoria Street, Wolverhampton. Over the years we have built up a client customer base from Wolverhampton and beyond and each week have hundreds of happy customers come through our doors.